Is the market tearing up the script? I must confess that I don't really like nor understand the breed of perma-bears which have sprouted since the financial crisis. I appreciate all inputs into the market discourse, but it is difficult to hail Hussman, Edwards and their ilk as wizards of forecasting, when they have been so spectacularly wrong for so long. Whatever you might think of them and their arguments, however, the horrendous start to the year means that investors, whatever their inclination, probably need to have a closer look at their play book. The long-term chart of the S&P 500 looked challenged even before the recent train-wreck, and if the market closes out here for the month (a big "if" to be fair), it is difficult to see how it can recover without a noticeable further correction. Commentators warning about a repeat of 2008 are being over dramatic in my view, but just because it won't be cataclysmic, doesn't mean things can't get a lot uglier. It is useful, I think, to distinguish between two timeframes here. We all know that Mr. Shorty will walk into the office very soon waving Albert Edwards’ recent presentation, only to realise the market has gapped up and his stops have been run. But the question is whether the lurch lower signals the start of a bear market, in which case you are selling the rallies. My base case was/is that this year would be the year of a big and frustrating range, while this and next year and 2018 would be the year of the bear. Why? Well because it takes time for interest rates to fester enough to really bite, and 2017 and 2018 are very big years for non-financial debt rollover schedules. This doesn't mean that 2016 couldn't be bad, but my assumption was that we would not roll over into a collapse. Or more specifically, that you could still play the range and buy dips this year. But that call is now becoming difficult to sustain, and the market has to step back from the edge soon to make it come home. There are signs, though, to suggest risk assets could snap back very fast, very soon. 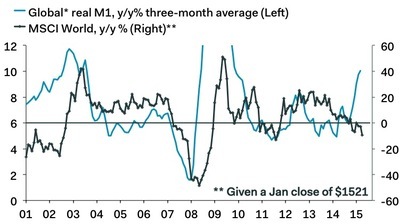 Global M1 growh has jumped recently mainly due to continuingly strong growth in the Eurozone and China, which doesn't square with weakness in equities. The main discussion among punters circles around the dichotomy between the the drag from commodity deleveraging and non-financial debt distress on the real economy (see here and here), and lower energy prices as a boost to consumers' spending. 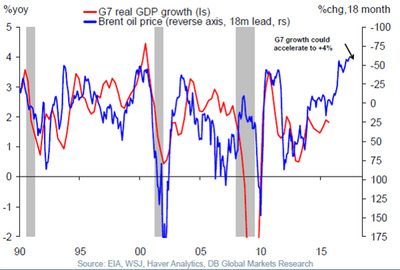 Economists generally take the oil price as given, and a lower oil price normally leaders to higher growth forecasts. A recent chart from DB's Torsten Slok is a good example. I must admit that I am always suspicious about anything with more than a 12-month lead, because it amounts to dangerous “fitting” when it comes to cyclical data. This is to say that I should be able to predict GDP(t+0) pretty effectively with GDP(t-18) or GDP(t-24). That's why some data are cyclical after all, but we need to distinguish such frameworks from fundamental frameworks. For what it’s worth though, the more detailed statistical studies I have seen does suggest a lift growth from lower energy prices and vice versa. A counter argument to this, however, is that while the link between consumers’ spending and low energy prices is linear—and in a "Ricardian Equivalence world", it should actually be quite small—the impact on the economy from debt distress, deleveraging, EM slowdown etc is potentially non-linear once the dime drops. Some of us have been talking about this for over a year, but Krugman recently waded in with the mainstream argument. One factor, for example, is that sovereign wealth funds are now no longer accumulating assets, but shedding them as described in a recent JPM analysis. These guys are big players, and the argument reasonably goes that as the liquidity and capex pump from commodity producing nations stop due to excess capacity and crashing oil prices, it's time to watch out below. A corollary to this point—which the Austrians love to trod out—is that central banks' inflationary policies have inadvertently created a huge deflationary blanket over the global economy by inciting the energy sector to go on a debt and production bonanza. Maybe this is one for another day, but it certainly rings true as far as the equity market goes. Which is simply to say that if the market starts to trade off of that narrative, it could get a lot worse, very quickly. For all the stimulus delivered by OECD central banks. the BOJ is really the only central bank actively buying equities. Investors can also still hope for a boost from the GPIF, though, and one has to assume that part of the euro area surplus will be funnelled into equities too, although so far it has been predictably been going into bonds, at least based on the latest current account data. I still think, broadly speaking, that central bank policy counts as a positive non-linearity here. Arguably the reason we have QE and negative rates in the Eurozone, for example, is because of low oil prices. When you look at the macroeconomic data in the euro area, Mr. Draghi has essentially pulled a reverse Trichet. In 2008, the ECB hiked rates just before disaster struck due to fears over second round effects from higher oil prices. Now the same fear over negative second effects has prompted the central bank to ease significantly—and more could be on its way—at a point in the cycle where the economy already in recovery mode cyclically speaking. In Japan, Kuroda has recently rebuffed claims of more easing, but I think further downside in the USDJPY could force a re-think. In the end, though, debt is debt and will have to be repaid. Indeed, in the energy sector, I think the market could easily unravel quickly and violently, but also rebound strongly, unlikely the zombification of some banks and mortgage markets after 2008. The main point remains, however, that the knee-jerk reaction to a deflationary scare just seems to be more QE, lower mortgage rates, and at least to some extent, happier consumers. Do you think U.K. consumers care about the FTSE for example? Nope, but they do care about interest rates and the housing market. I concede that the milage we'll get from extra monetary easing, or simply less tightening, can't stop market forces. But it is still an important part of the story, compared what was really an inflationary shock in 2007 that forced central banks to tighten quickly and aggressively. It’s interesting in this regard to dwell a bit on what’s going on the euro area. In short; absolutely nothing if you look at the macro data at least. I now know how it felt like to be writing about the U.S. economy in 2010 and 2012 when Europe was blowing up—and U.S. markets were under the weather—but the economy doing alright. It’s then with hesitation that I proclaim the “buy the dip” regime to be unchanged in Europe. I also think that divergences going into this sell-off are so big (i.e. relative performances between sectors and asset classes have been absolutely stretched to extremes) and I think some markets could surprise a lot both to the upside and downside. In the short run, though, Spoos and oil appear to be the drivers, but just as you shouldn't be complacent, don't fall victim to recency bias, and assume that things will automatically follow the devastating script that played out in 2008. Are Negative Interest Rates Ineffective?